Loopcenter is a program I wrote basically as a music-practicing tool. I didn't want to shell out for a Boss Loop Station guitar pedal, and I figured I could achieve the same functionality pretty easily with a simple program. The result was 'Loopcenter'. 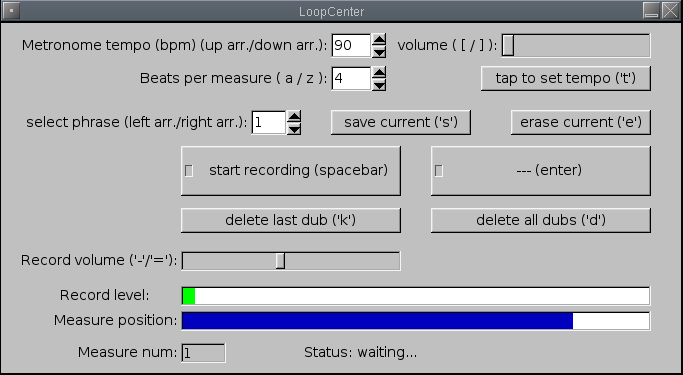 Loopcenter lets you simply record loops for any audio you route to it (via JACK), and it plays it back in a loop. You can overdub the loop as well. Every recording is rounded to the nearest measure. Accordingly, you can adjust the beats per measure, and the tempo. I usually use loopcenter to practice improvising over a chord sequence.